The kitchen is coming along, we had our dishwasher reinstalled and fixed. It was a faulty valve that caused our dishwasher to leak during our Christmas vacation. So G.E. came out on Friday and repaired it. So that's good news I guess! A heating/air conditioning company also came out and replaced our duct work in the crawl space that water leaked into. Other than that, we're just waiting on our new floors to get installed and our countertops. Tomorrow we should be getting our hardware that we ordered so we can hang our cabinet doors back up. In the meantime I was inspired to clean up our junk drawer a bit in the kitchen. Here it is. What a mess. It was driving me a little bit crazy not being able to find anything. I also was so inspired by this post on Iheartorganizing's blog. So for about a week I collected cereal boxes and other food boxes so I could DIY some drawer dividers. I put them in the drawer to see how many would fit in it. Then I used my pencil to mark how high I should make them. Then I used scissors to cut them down to size. Next I picked out scrap book paper from my stash to cover each box. For this part you just need a ruler, scissors, and tape. I created a sample one first to see how best to cover them. I played with a few different ideas. Here I am covering the bottom. Then I wrapped up the sides. I found the best way to cover them was to line the inside so the paper was noticeable from the top, because it really doesn't matter if the bottoms are covered. But it's up to you how much you want each part covered. I ended up rearranging my boxes a bit so they were a little bit more interesting. 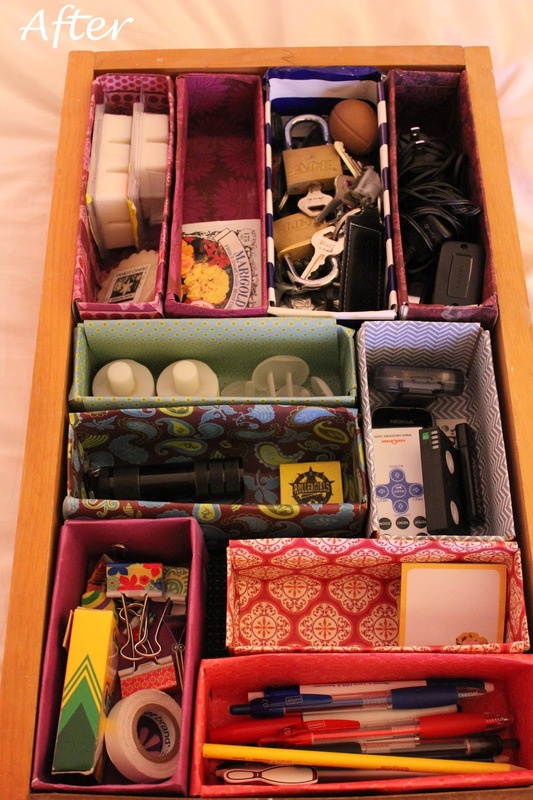 They turned out so cute and added so much more vertical storage space in my drawer. I sorted through all the junk and threw out stuff that wasn't needed anymore and kept the important stuff. Here's where my junk drawer lives now in the kitchen. 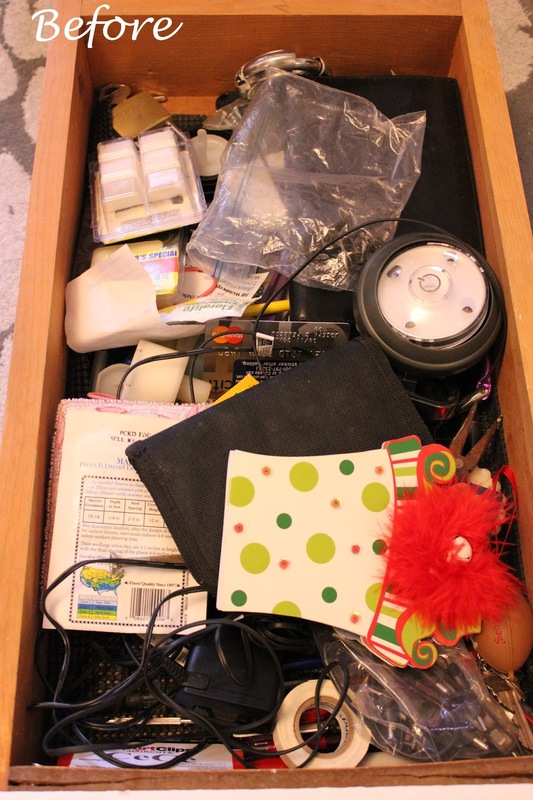 It's going to be so much fun opening this drawer up now. I was happy to reuse old boxes and stuff I already had for this project. Hope this inspires you to organize your junk drawer too!